Pregnancy. It does weird things to your body, it does weird things to your hair, it does weird things to your face and it’s hardly surprising if you don’t look quite the same afterwards. In fact it would be weird if you did look the same – you’ve just grown and produced a human being and life is never going to be the same again. I gained around a stone and half in weight during each of my pregnancies and was lucky enough to shed it fairly quickly after baby number one and baby number two – something I put down to breastfeeding (did you know breastfeeding alone can burn up to 800 calories a day?!) and running in pregnancy and then afterwards. But after baby number three it’s been a different story. It’s been five months since Littlest B was born and I’m still around a stone heavier than I was pre-pregnancy. Of course after being repeatedly stretched in all directions I know things will never be quite the same again, and I know getting back to your pre-pregnancy body shape can’t happen overnight – in spite of what some fitness bloggers would have you believe. The fact is these things take time and I’m slowly getting there. 1. Be patient. Did you know that during the birth of your baby you’ll lose between 13 and 20 pounds, which is already a huge step! Don’t be in a hurry to lose the extra pounds – going on a strict diet at this stage when you need to recover from pregnancy and birth is a bad idea. Your body has been pushed to its limits and you need all the strength you can to look after your baby, especially if you’re breastfeeding. 2. Tone up. Firming up your abs through exercise won’t help you shed weight per se, but it will help you tone up and smooth the belly area without having to restrict your diet or book yourself in for a liposuction in Harley Street. Ask your doctor or midwife for advice on a safe post-pregnancy abs routine. 3. Take care of your body. You might have a little more cellulite or wobbly bits than before but it’s not about losing weight, just firming up the tissues. Start low impact activities such as cycling (see https://bike-discounts.co.uk/ for some great discounts) and swimming and don’t forget to hydrate your skin: invest in a good anti-cellulite hydrating cream to massage onto your skin each night before bed. 4. Eat a balanced diet. Instead of restricting yourself simply stick to a few principles: you can eat a bit of everything, as long as you’re hungry. Don’t skip any meals to avoid snacking later and drink copious amounts of water all day. Opt for veg and fruits, whole grains and lean meats when you can but don’t sacrifice flavour: unlike most fad diets, you have to enjoy the food you eat if you want to stay healthy for good. 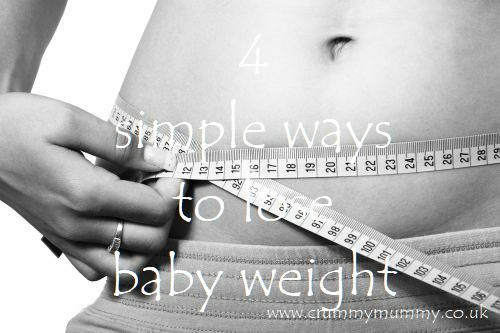 Did you find yourself with a bit of extra weight after having a baby? What did you do about it and what are your top tips? I’d love to hear what they are! A nice read. There is a lot of pressure on new mums to bounce back into shape when, unless you have a team of personal trainers and chefs at your beck and call, is just unrealistic. We need more posts like this highlighting the fact that are bodies go through huge changes before, during and after childbirth.